The Lorax loved his trees, and so should you! 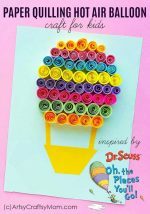 Spread the love for our planet with a Lorax inspired Truffula Tree Craft, based on Dr Seuss’ favorite book! 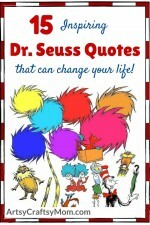 Even if you’re among those who haven’t yet read ‘The Lorax’, you’re sure to have heard this quote, a one with deep and profound meaning, much like all classic Seuss quotes. While the context of this quote is regarding saving the environment, if you think about it, it can apply to just about any of the problems that ail the world today. I just love how this book reflects real life so beautifully. The Lorax gives repeated reminders which the Once-ler ignores; just like we’re getting signs that the environment is in trouble, but we’re not doing anything about it. But not anymore! We have the power to change the world – all we need to do is to care ‘an awful lot’! 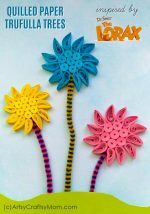 And we can start today, with a Truffula Tree Craft inspired from The Lorax, which is a great way to teach kids that saving trees is not just about losing out on raw materials, it’s also about saving animals’ homes and maintaining our climate. 1. Start out by making zigzag lines on the straw with a black sharpie. If your straw already has a pattern like this, it’ll be easier. 2. Take out a piece of the tack it and roll it into a tiny ball. Stick it to the top of the paper straw. 3. Attach the large pom poms on the tack it on top of the straw – press to secure in place. 4. 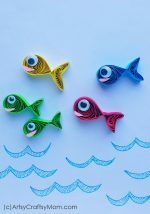 Now, if you’d like to make the Humming Fish along with the Truffula trees, you can use plain fish-shaped embellishments and stick on googly eyes to make them look like the iconic characters from the book. 5. 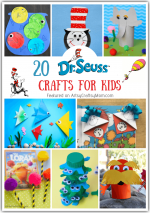 And just like that, your Lorax inspired craft is ready! Isn’t this craft super easy? Saving the planet is just as easy too, as long as each of us does our bit. 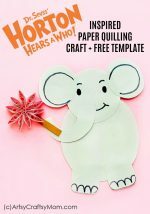 This is a great craft for a Dr. Seuss theme party, along with a Horton hears a Who craft and the One Fish Two Fish Red Fish Blue Fish collage. This is also perfect for a Show and Tell on Earth Day or World Environment Day. So go ahead and spread the word – let everyone realize that we can make things better!